Olentangy Liberty’s Corbin Parrish intercepts a pass in front of Olentangy’s Caden Kaiser, right, during the first quarter of Friday’s OCC showdown in Powell. A host of Liberty defenders converge on Olentangy’s Ian Drummond during the first half of Friday’s league game in Powell. 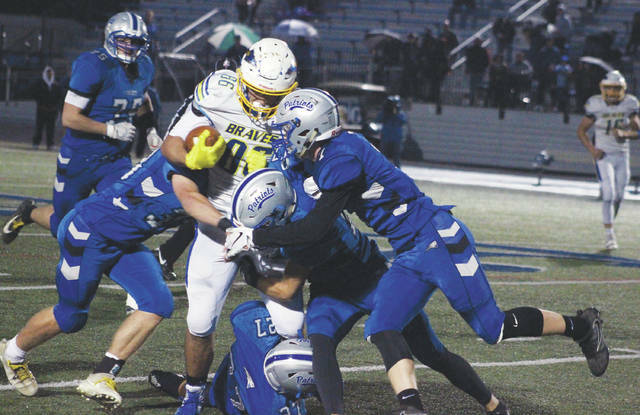 The Olentangy Liberty football team took advantage of a couple mistakes by rival Olentangy, building a three-touchdown lead before holding off a late rally in a 21-14 win Friday night in Powell. The win gives the Patriots sole possession of first place in the OCC-Buckeye and likely ends Olentangy’s chances of making the playoffs for the first time since Mark Solis’ first season. Mitchell Okuley threw for two touchdowns and ran for a third to account for all of Liberty’s points. He had 140 yards passing, completing eight of 10. Aidan Kinley ran for 140 yards on 22 carries as the Patriots (5-3, 3-0) ran for 177 yards. Corbin Parrish intercepted Trent Maddox in the end zone on Olentangy’s first drive, which had gone 57 yards to Liberty’s 28 on 15 plays. Liberty didn’t get points off the turnover, but it stopped Olentangy from taking an early lead. The Patriots did get points off the next two mishaps, though. Okuley found Kyle Wilson wide open over the middle on a 49-yard touchdown play on the first play after an Olentangy 16-yard punt gave them good field position. The score gave Liberty a 14-0 lead with 3:03 left in the half. Olentangy moved the ball down to Liberty’s 11 on an 11-play, 69-yard drive before Tyson Chapman stepped in front of a Connor Haag pass at the 2 and returned it 87 yards to set up Okuley’s second touchdown pass. “We figured we had one chance and then a field goal,” Hale said. Okuley found Chase Miley on an 11-yard pass with four seconds left in the half to push the lead to 21-0 at the break. Okuley also scored on a 5-yard run in the second quarter to give Liberty the lead. Olentangy finally got on the board with a little over 11 minutes left in the fourth. Haag found Ian Drummond from 12 yards out. 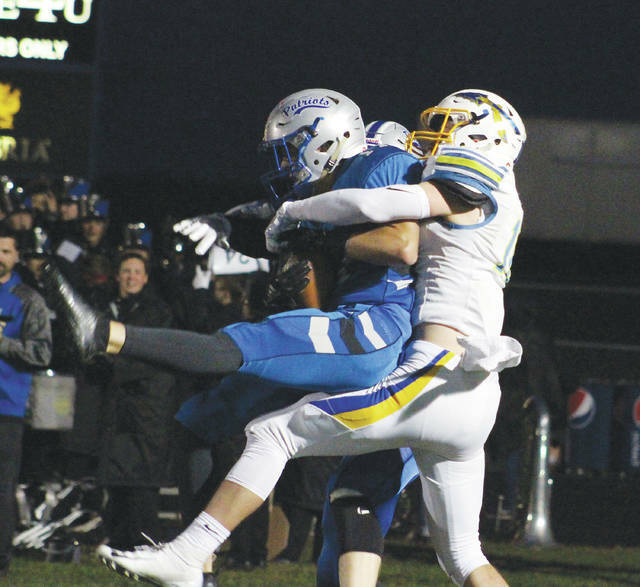 Then, Haag scored on a 3-yard scramble with 5:29 left to cap a 7-play, 45-yard drive, cutting the deficit to 21-14 after Olentangy recovered its second fumble. Okuley showed little effects of the ankle injury that kept him out almost two games at the beginning of the season. That wasn’t the only thing that plagued the Patriots early in the season, Hale said. “We had Okuley’s injury, then we got hand-foot-and-mouth disease and all these other things that we had to deal with,” he said. “We’re hopefully getting back to where we have … all the guys back in the lineup. I think we’re still sitting in a good position. Haag went 22-for-34 for 229 yards, a touchdown and two interceptions with Luke Riedel being his main target. Riedel had seven catches for 81 yards. Zach Shiblaq finished with 82 yards rushing on 22 attempts to lead Olentangy (3-5, 2-1). Both teams continue league play next week. Liberty hosts rival Olentangy Orange while Olentangy returns home to face Westerville North. Both are set to start at 7 p.m.
https://www.delgazette.com/wp-content/uploads/sites/40/2018/10/web1_corbin.jpgOlentangy Liberty’s Corbin Parrish intercepts a pass in front of Olentangy’s Caden Kaiser, right, during the first quarter of Friday’s OCC showdown in Powell. https://www.delgazette.com/wp-content/uploads/sites/40/2018/10/web1_drummond.jpgA host of Liberty defenders converge on Olentangy’s Ian Drummond during the first half of Friday’s league game in Powell.